Frank Ellison, the dean of pioneer model railroaders in the U.S., wrote an influential series of Model Railroader magazine articles in the 1940’s called “The Art of Model Railroading.” He started off by saying, “In our dedication to modelbuilding and model engineering, we seem to have forgotten that both are only contributing elements to the consummate art of model railroading” — by which he meant running our layouts like railroads, realistically reproducing all the drama and excitement of the real thing. Frank’s ideas are still important in the 21st Century. And we’ve come a long way from the days of bare, unscenic ovals of track with parades of beautifully manicured train models passing by. In fact, the hobby has been so successful that artists today use ideas drawn from our layouts as parts of their works — helping to give form to their views of reality! 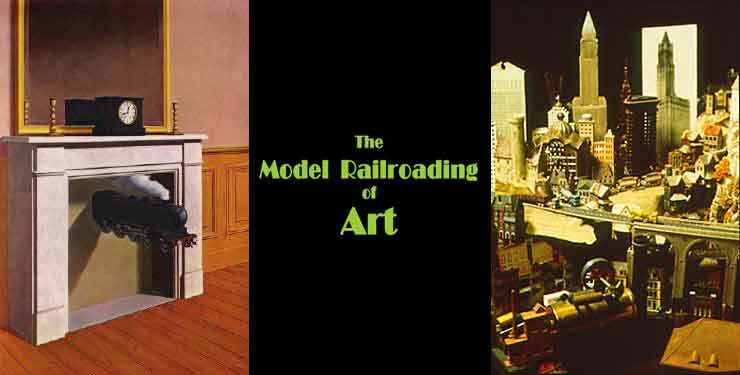 Thus, this page is dedicated to “The Model Railroading of Art.” What can we learn from the ways today’s artists make use of model railroads in their works? For openers, take a look at the works flanking the title of this page (above). On the left is a famous painting by the Belgian surrealist, René Magritte. It’s called Time Transfixed (1938). 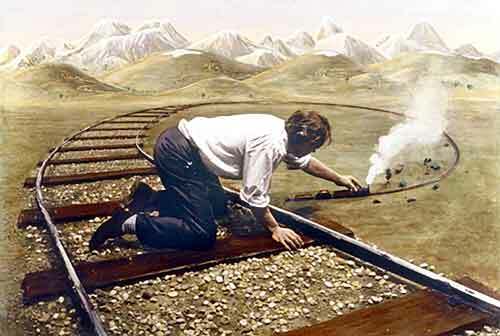 Like most surreal works it can mean many things, but one thing is for sure: it’s the exact opposite of “making the trains run on time!” This painting is the finale of a tongue-in-cheek section of this website called “Famous Artists’ Model Railroads.” If you haven’t already seen these little animations, be sure to take a look: they’re playful treatments of classic artworks to represent model layout settings. But today’s art has surpassed my efforts! 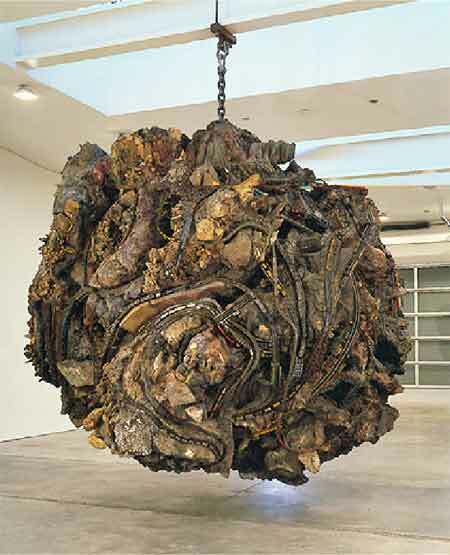 On the right of the title block is a work by a current U.S. superstar of the art world, Chris Burden. This view shows just a small part of an “elaborate stage-set of toys and model buildings mounted on 25 tables” called Pizza City (1996). 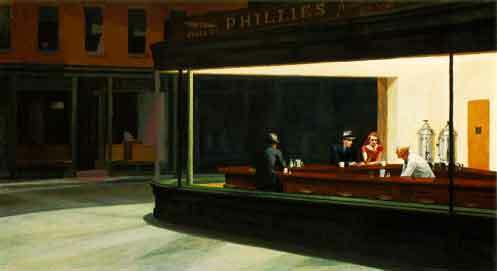 It was premiered at the prestigious Whitney Museum of American Art. Z scale trains were threaded through an incredible variety of structures, cutouts, bridges, and more — presumably commenting on modern urban life. 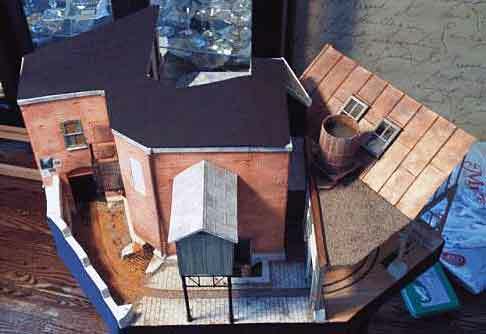 Our model city scenes are usually less complex and perhaps more realistic… but do they pack as much of a whallop? 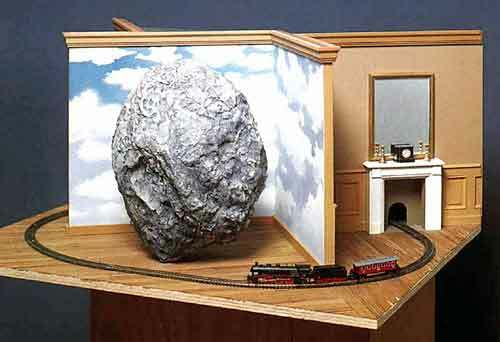 This sculpture of a model train running through three scenes from Magritte paintings could be entered in almost any train show! It’s actually constructed by a Belgian artist. Sometimes the line is thin between hobbies and art! perhaps an early attempt at DCC? —and at least one panic button. Remind you of any layouts you’ve seen? This one also baffles me. 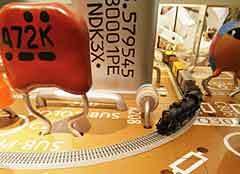 It’s on display as a work of art in the Kaiser Wilhelm Museum, in Krefeld, Germany. The central feature is two RTR N-scale locomotives, nose to nose. An impasse? Time again transfixed? This Swedish artist seems to have developed his own style of pizza layout. He lives and works in Stockholm. This piece is motorized, and the top may be the bottom. There’s only room here for a small taste (above) of the highly imaginative environments displayed … the Trainscape website provides full details. 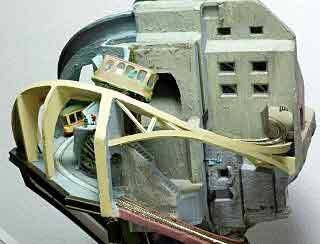 This exciting experiment drew art and model railroading very close, but clearly separated the two. The next example removed that separation. 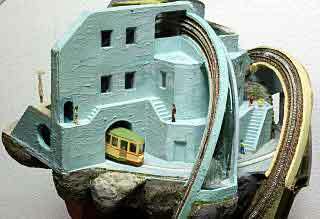 With Ms. Karavasiles’s work we move much closer to the integration of formal Art with true Model Railroading. She makes public installations, on a grand scale, much as Christo does. She wanted to cover the foothills around San Diego with works of monumental art. 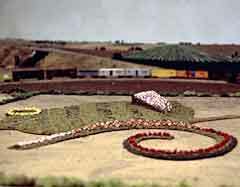 However, she was unable to deal with 43 governmental agencies and 477 land owners, so she turned instead to the San Diego Model Railroad Museum, which displays models of those foothills in three scales — N, HO and O. 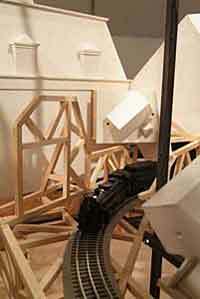 She designed her monumental sculptures in 1:160, 1:87 and 1:48 sizes and installed them on the Museum layouts! There are lots more photos on her website and a good article about this installation here. The artist’s own comment about the works: It might take a moment to tell from the images that these pieces are not monumental in scale, but just the opposite, miniatures. 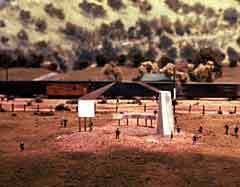 It was this same ambiguity of scale that attracted me to the Model Railroad Museum. The pieces I made integrated into the landscape and called attention to the craftsmanship of the people who had built this other world. 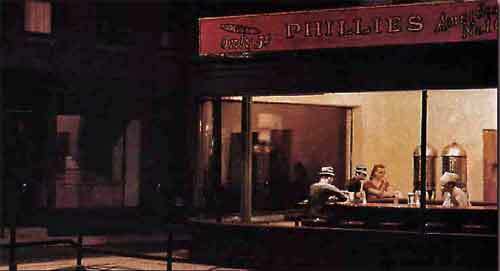 Perhaps the best-known example (to modelers) of the integration of Art and Model Railroading is the late John Armstrong’s brilliant translation of Edward Hopper’s painting, Nighthawks, into an O-scale structure on his famed Canandaigua Southern Railroad layout. 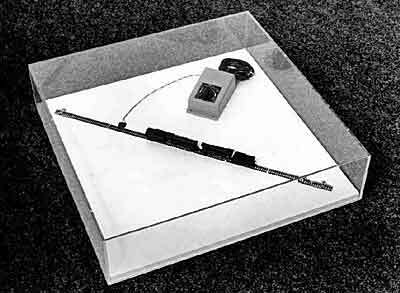 John described the translation process in Model Railroader magazine for January 1989. Here are photos of the two artworks — painting and structure model. Quick … which is which? These last two examples — from Karavasiles and Armstrong — showed how Art can be made part of an existing layout, to add additional interest and (possibly) meaning. I recently came upon another example of the adhesion of artistry with model railroading during a “gallery crawl” in downtown Pittsburgh. 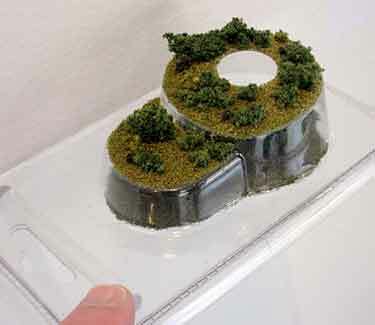 In the Space Gallery I discovered some works by Carin Mincemoyer, a local artist who creates “model landscapes” in transparent plastic packaging, using lichen and ground foam—the same scenic materials we use. 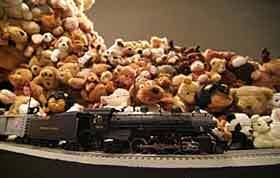 Here are photos of two of Carin’s works … each paired with a comparable model railroad display. 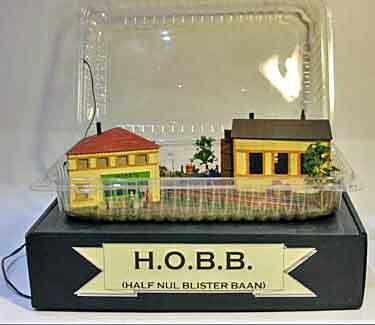 At the left is a small Mincemoyer work; on the right is a small model railway built in a cake blister by Albert Winkel from the Netherlands and described in Scrapbook #65. Sometimes the contraints of the medium can effectively define the work (ask any micro layout designer!). 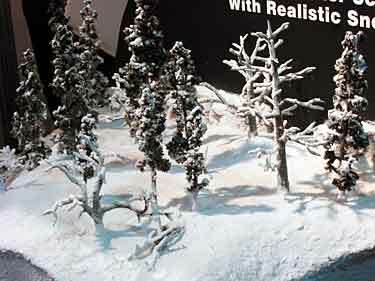 Here, paired with a very small Carin Mincemoyer work (left) is a Woodland Scenics display of their snow-scene materials… nearly a work of art in itself. Choice of materials can also define the work — or the layout! 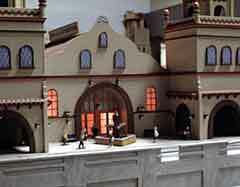 We’ve been watching the worlds of Art and Model Railroading moving closer and closer together. The question remains, “Can a model railroad be a work of art in itself?” You be the judge… here are some examples that have caught my eye. I’d like to hear from anyone who has some additional examples to show. 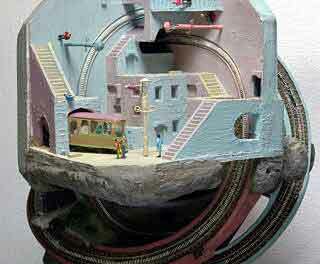 Ian built this as an experiment in sculptural layout design when Gn15 was a fledgling scale. 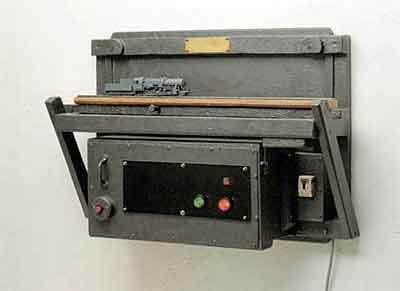 In common with most artworks that use model rail materials, it never ran trains. 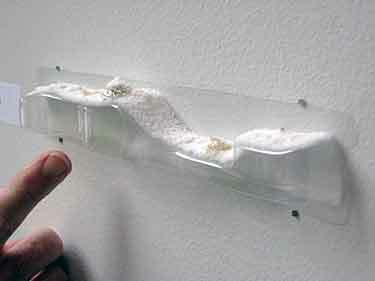 But it has been exhibited a number of times as a pleasing sculptural design of interest to modelers. 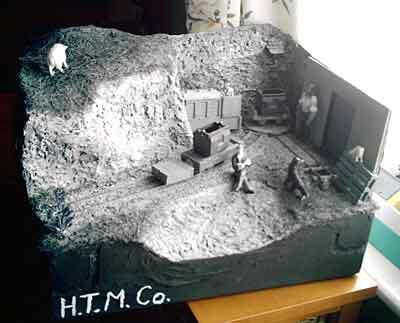 For a lark, Bob built a small layout in black-and-white. It turned out extremely well. 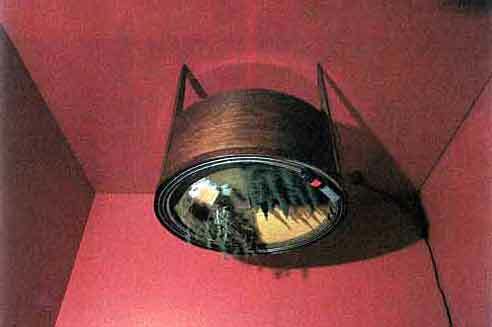 Look carefully… this is a color photograph! For more, see Scrapbook #65. Rehsi’s remarkable tour de force is a small layout that operates in three axes of rotation, modeled after M.C. 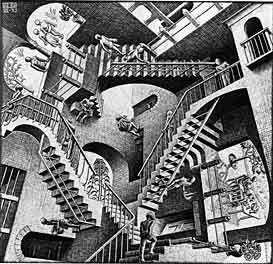 Escher’s topsy-turvy print, Relativity (lower right). There are more details in Scrapbook #67a and even more at Rehsi’s website. Designed as a working artwork, this piece combines command of both mechanical construction and artistic perception… a hybrid performance that is unique in my experience. Can anyone match it? 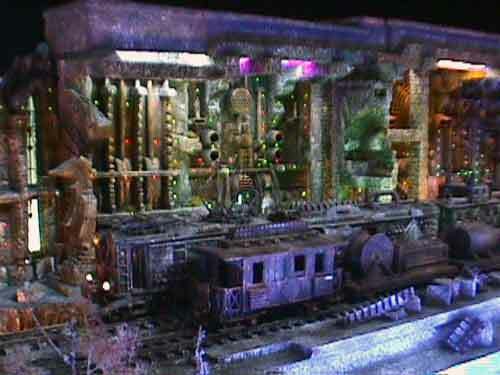 Is there a model railroad layout that does railroad-like work as well as providing artistic unity and excellence? Finally, it’s difficult to draw any convincing conclusions from this quick sampler of current art with model railroad overtones. Obviously there are lots of different ways to look at trains, just as there are a great many ways to view contemporary art. My hope in presenting these widely varied works is to give us all a broader view of “what is a layout?” as well as to spark some new trains of thought (pun intended) in our designs. Obviously you don’t need an artist’s eye to make a good layout, but it can help! I owe a debt of gratitude to Bart Bakker, from Utrecht in The Netherlands, who provided most of the European information for this report along with significant encouragement to make it possible. Bart also led me to some invaluable resources beyond those credited above, particularly Katherine Dilena’s excellent online article about the seminal German exhibition of 1994, Die Eisenbahn In Der Zeitgenössischen Kunst (The Railway in Contemporary Art). Others who provided significant help were Brian Fayle, from Ontario, Canada; and Frédéric Delaitre, from Paris, France. Many thanks to them all! Needless to say, none of them is responsible for any opinions expressed here, all of which are entirely my fault.